Named after Dartford Heath, in Kent, where it was first recorded in Britain as a breeding bird in 1773, the Dartford Warbler is associated with dry lowland heath. Dartford Warblers are tyically 13cm in length with a wingspan of about 16cm. The male and female of this species are somewhat similar in appearance, but seen together they can easily be distinguished. Males have slate-grey upperparts, cherry red breasts flecked with white, and wine-red underparts; females have paler underparts, especially the throat, and they have browner grey upperparts. The eyes of Dartford Warblers have distinctive red outer rings. Perched often on the top of a Gorse bush, the male Dartford Warbler holds its long brown tail at a jaunty angle when it is singing, but its warble is erratic and scratchy rather than tuneful. 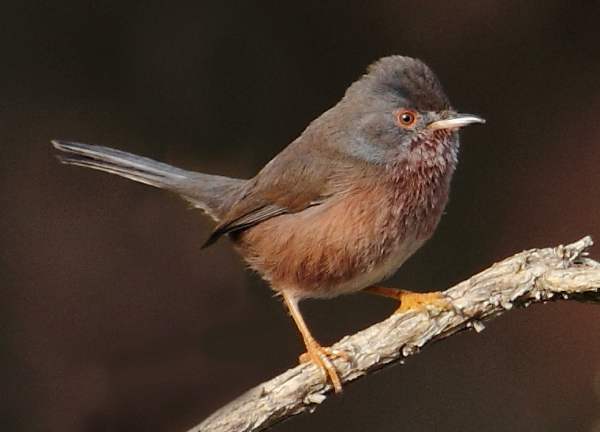 In Britain the Dartford Warbler is recorded most often in the south east of England, but it occurs also along most of the coast of southern England and around the Severn Estuary and the coastal strip of south Wales including the Gower and Pembrokeshire peninsulas. On mainland Europe, Dartford Warblers can be found in most western countries including France, Spain and Portugal. This species is also recorded in north-west Africa. These pretty little birds feed on insects, and being resident in Britain they are particularly vulnerable in harsh winters, particularly when the ground lies covered in snow for weeks at a time and flies and other bugs simply cannot emerge. 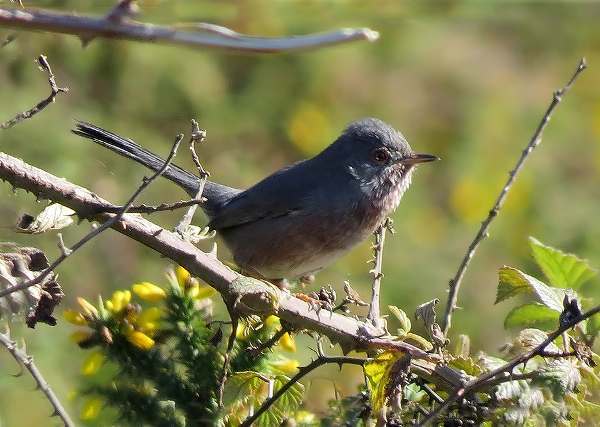 Dartford Warblers make their nests near the ground among dense gorse or occasionally heather. The cup-shaped nests are made mainly of grasses and lined with small roots and feathers. A cluth of three to five eggs is incubated, mainly by the female bird, for about two weeks. Two or even three clutches are produced from April to July.. In the early 1960s, Britain's Dartford Warbler population crashed to about ten breeding pairs, but since then the numbers have been gradually recovering; however, this bird is still considered to be an Amber List species in terms of its conservation status. Gorse, the favoured nesting and resting habitat of Dartford Warblers, is a very spiny bush and this provides added protection from predators, and it is also attractive to spiders, which contribute to the Dartford Warblers' diet. BirdLife International (2012). 'Sylvia undata'. IUCN Red List of Threatened Species. Version 2013.2. International Union for Conservation of Nature. This page includes pictures kindly contributed by Will Bown and Ray Tipper.